[Boolean90] needed an amplifier for a subwoofer, and had a lot of parts sitting around in a scrap bin. His project, a Class D sub amp made out of scrap, is a great example of what you can build with the right know-how and a very large pile of junk. With digital logic and PWM chips, a Class D amp is one of the simpler ways to get a lot of amplification easily in an efficient package. It’s really not that complicated; an audio signal is turned into a PWM’d square wave, this is sent out to a Mosfet bridge, and finally out to the speaker. Most Class D amps have a switching frequency of hundreds of kilohertz to the Megahertz range, but since this is an amplifier for a subwoofer that has a cutoff frequency of about 1kHz, the switching frequency doesn’t need to be quite as fast. [Boolean] is using a 50kHz carrier frequency; it’s more than high enough to recreate low frequencies. 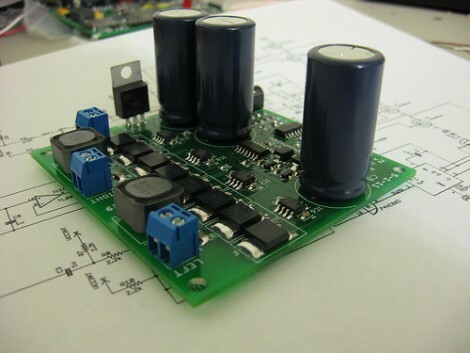 With the completed project, [Boolean] has an extremely loud amplifier that has around 75-150W of output power. The subwoofer is only rated for 200W, but with the volume [Boolean] is getting, this isn’t an amp he’ll be rebuilding anytime soon. Hang around in any of the many guitar or audiophile forums or discussion boards for long enough, and eventually you’ll come across the arguments over amplifier topologies. One of the more interesting and useful of these classes of amplifier is class d – they’re extremely efficient and when well designed can sound pretty good. [Afrotech] is here to show you how they work, and how to build a 15 Watt amp using a $3 class d amplifier chip. The very definition of an amplifier is taking a low power signal and transforming it into a high power signal. 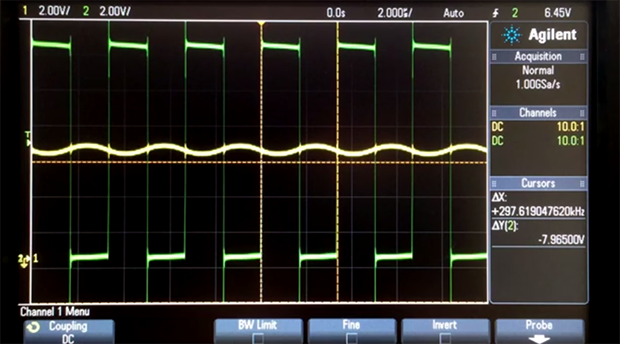 A great way to modulate a high power signal very quickly is by modulating a square wave with pulse width modulation. A class d amplifier takes a low power input signal, uses it to modulate the duty cycle of a high power square wave, and with a little filtering, amplifies the low power input. To demo this, [Afrotech] used TI’s TPA3122 class d amplifier chip. It’s a pretty cheap chip for being a 15 Watt stereo amplifier, and the circuit is simple enough to build on a breadboard. With a few caps, resistors, and a pair of inductors, [Afrotech] built this one-chip amplifier that’s capable of powering some pretty big speakers. It’s also very efficient – no heat sink required. Although class d amps are extremely efficient. there are a few people out there that say because the amplifier is basically a filtered square wave, you’ll be able to hear a difference in the audio over class a or class ab amplifiers. This led to the development of class t amplifiers, basically a class d amp with a higher switching speed (Megahertz for class t, a few hundred kilohertz for class d). Still, if you need a cheap amplifier for a DIY boombox or any other high power application, you could do a lot worse than a simple class d amp. In one of [Hans Peter]’s many idle browsing sessions at a manufacturer’s website, he came across a very cool chip – a 10 Watt class D amplifier chip. After the sample order arrived, he quickly put this chip in a box and forgot about it. A year or so later, he was asked to construct a portable boom box kit for a festival. Time to break out that chip and make a small amplifier, it seems. The chip in question – a Maxim MAX9768 – is a tiny chip, a 24-pin TQFP with 1mm pitch. Hard to solder freehand, but this chip does have a few cool features. It’s a filterless design, very easy to implement, and perfect for the mono boombox project he was working on. A simple, seven component circuit was laid out on a breadboard and [Hans] got this chip up and running. For the festival, a breadboarded circuit wouldn’t do. He needed a better solution, something built on a PCB that would work well as a kit. The requirements included the MAX9768 chip, a guitar preamp, stereo to mono summing, and through-hole parts for easy soldering. The completed board ended up being extremely small – 33.6mm by 22.5mm – and works really great. After the festival, [Hans] found a 20 Watt chip and designed an all-SMD version of the board. Just the thing if you ever want to stuff a tiny amplifier into a crevice of a project. If you’re looking for a DIY amplifier project made with a minimum of parts, this is the build for you. [Rouslan] created a 70 watt class D amplifier using an ATtiny45 and just a few dollars worth of additional components. A class D amplifier simply switches transistors of MOSFETs on and off very rapidly. By passing the signal produced by these MOSFETs through a low pass filter and connecting a speaker, a class D amp is able to amplify a signal very efficiently. Usually, these sort of amp builds use somewhat esoteric components, but [Rouslan] figured out how to use a simple ATtiny microcontroller to drive a set of MOSFETs. In [Rouslan]’s circuit, the audio signal is passed into the analog input of an ATtiny45. Inside this microcontroller, these analog values are sent to the MOSFETs through a PWM output. [Rouslan] threw in a few software tricks (explained in revision 2 of his build) to improve the sound quality, but the circuit remains incredibly simple. [Rouslan] posted a video going over the function of his ATtiny amp, and from the audio demo (available after the break), we’re thinking it sounds pretty good. Amazingly good, even, if you consider how minimalistic this 70 watt amp actually is. Thanks [Alec] for sending this one in.